This product alert showing Heathered Deep Camo Cool Racerback Tank is from Australia but I believe some show rooms in the US are starting to receive items in this color. It’s so gorgeous, especially the contrast seam detail. "Did You Order The City Beat Pant This Upload Thursday Morning?" "Gratitude Wraps Are Coming Back!" Is it me or does camo look exactly like wren? I just bought the wren CRB and they look identical. Am I mistaken? I agree it really does look like wren in these photos. 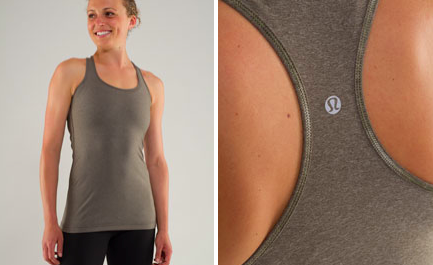 If you watch a You Tube video by Lululemon called, "(un)confined, (un)limited, (un)mat", I think the woman is wearing a top in Heathered Camo and it also looks a lot like wren. Guess we'll have to wait and see it in the store unless you can help us Lulumum! I was going to say the exact same thing- this looks just like wren. lululemon must think that we are stupid. i wish lulu would stop with the colors muted down by grey and brown shades. give us a nice, true emerald green already. I agree with above comment…the muting of colors with grey and brown is getting old, and bland.